Boys Shorts Season Is Here!! The sun and the warm weather are finally here to stay. So let’s get ready for the best summer ever. Shorts are a must have for hot weather, and boys go through clothes fast in the summer. The heat of summer is a mix of sweat and dirt and gosh it makes for a lot of loads of laundry. So moms around the globe will be looking to staunch that by keeping up with supply and demand, and that means we need more shorts. Stat! 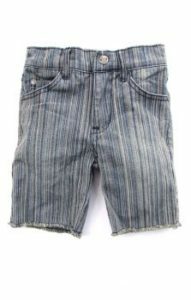 The Boy’s Store understands that is why we have lots of shorts available for your boys in a variety of styles, sizes, and prices! Check out the incredible items we have available now from Wes and Willy, Appaman, Kitestrings, and Rabbit Moon. 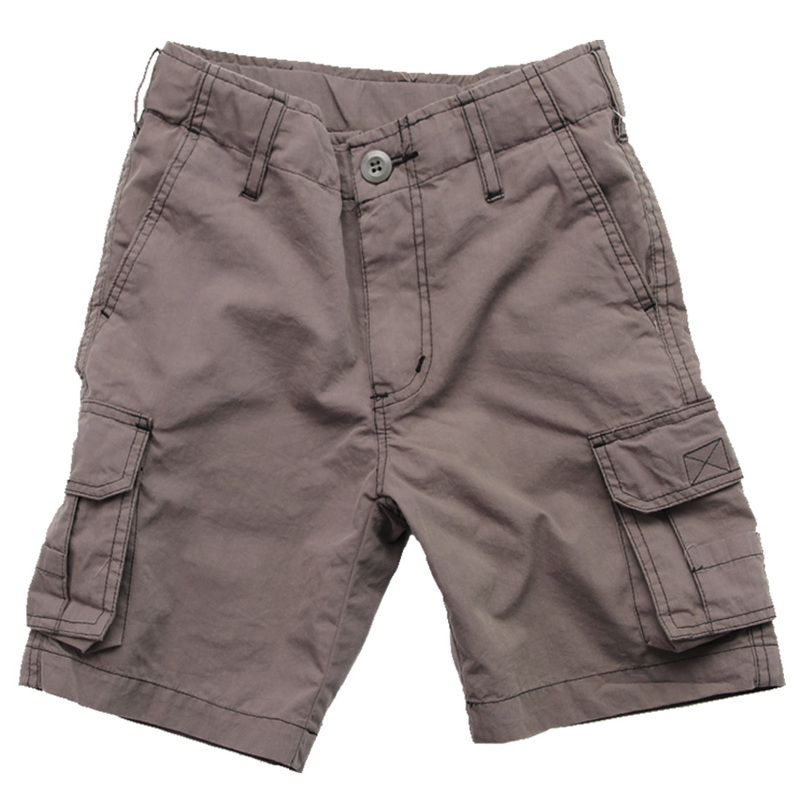 Little Boys’ Wild Twill Cargo Shorts by Rabbit Moon: Even the littlest of the boys need to look good. Rabbit Moon creates fun and whimsical looks for the little boys in your life. These shorts are perfect for following around the big kids and exploring the world around them. Boys’ Denim Rail Road Shorts by Appaman: These shorts are fun. They almost scream throwback, classic, old school. Boys will love them because they are comfortable, you will love them because they are super easy to keep clean! Boys’ Cargo Shorts by Wes and Willy: Cargo shorts are among the favorites of boys everywhere. They are comfortable, easy to wear, and they carry everything they want with all those pockets. These shorts will be worn, a lot! 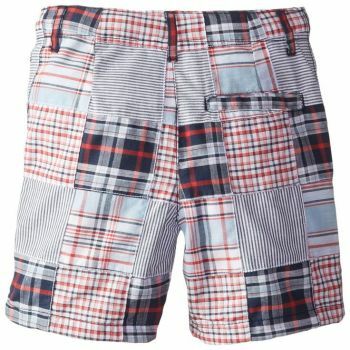 Kitestrings Boys’ Plaid Patchwork Shorts: these fun red, white and blue patchwork plaid shorts are fun, comfortable, and add a bit of preppy style to your boy’s wardrobe this summer. This entry was posted in boys clothing and tagged Appaman, bottoms, boys clothes, Boys Shorts, kite strings, Rabbit moon, shorts, summer clothes, Summer looks, summer style, the boys store, Wes and Willy on April 17, 2017 by Lacy. La Miniatura: Tie Dye Looks! We love fun outfits, the reason we exist is to bring you and your boys fun, trendy, stylish looks that you just can’t find anywhere else. That is why we love the fun new looks from La Miniatura. Boys love the outrageous, the wild, and the fun. That is why these new pieces from La Miniatura are sure to be a hit. They will make your boys summer even more fun acne outrageous than it already is! Tie Dye Gauze Woven Shirt by La Miniatura: this ivy colored short-sleeve button down shirt is the perfect top for summer. 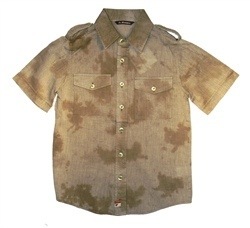 It’s gauzy material will help your boys stay cool and comfortable, while the tie dye appearance keeps them looking cool! This shirt is great for days spent outside with friends or dressing up for a summer event that is still semi-casual. No matter what your boys will arrive cool, comfortable, and ready to party. Tie Dye Nub Shorts by La Miniatura: these tie dyed cobalt blue nub shorts are sure to make a cool summer even cooler. With an adjustable waistband they will even grow with your boys, which us moms know is just about the best thing ever! 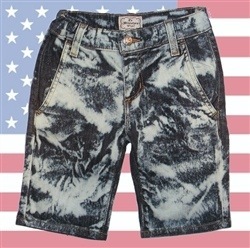 Brushed Denim Jean Shorts by La Miniatura: these fun black denim shorts are not quite tie dye but they share a worn, and faded look that will impress all of your boys. The dark jeans will complement any great La Miniatura top, including the great tie dye woven shirt. 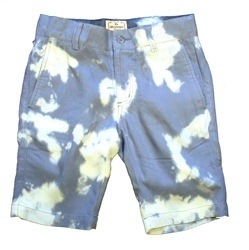 Tie Dyed Skinny Shorts by La Miniatura: we know boys love their trends just as much as girls do. That is why we offer trendy looks like skinny shorts. La Miniatura sure delivers with these awesome skinny shorts, not only are they skinny shorts they are tie dye skinny shorts in hot crayon colors that will make your boys very happy. 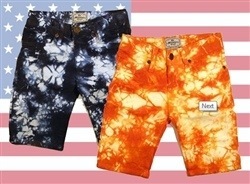 No matter what their style is, laid back comfortable jean shorts, trendy skinny shorts, or cool nub shorts your boys will love the incredibly cool tie dye looks from La Miniatura. This entry was posted in boys clothing, Brand News, Featured item and tagged boys clothing, denim shorts, la Miniatura, nub shorts, shirts, shorts, skinny shorts, the boys store, tie dye, tie dye looks, trendy boys clothing on July 10, 2014 by Lacy. Wes and Willy: St Patty’s Day Gear! St. Patrick’s Day is creeping up on us. For all of you Irish- American’s out there that live for this holiday, or even those that just love the Good Ole Irish, it is time to get ready! Parents may not remember that far back (ouch I know but I am including myself in this statement so never fear) but St. Patty’s day is a big deal at school. Remember that fun little game of wearing green? If you aren’t wearing green you get a pinch! While we don’t condone actually on hong, it is fun to get into the spirit by donning the festive color. So we were excited when we saw some great items in the Wes and Willy collection that would be perfect for St. Patty’s Day. 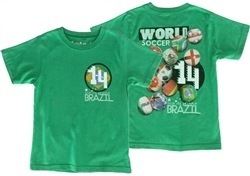 World Soccer Shirt by Wes and Willy: this awesome green shirt features some great soccer balls covered in their nations colors. It even includes the wonderful Emerald Isle, Ireland. Nobody is getting pinched in this great shirt! 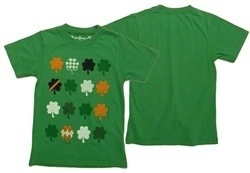 Shamrock Shirt by Wes and Willy: another great green shirt this awesome shirt also features the incredibly Irish Shamrock. Shamrocks are the symbol of great luck in Ireland and all around the world. Wearing this vibrant shirt will definitely get you out of a pinch, and maybe the luck will get you a good grade on that pop quiz! 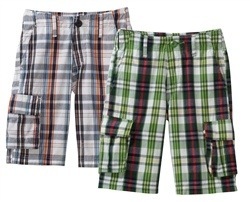 Plaid Cargo Shorts by Wes and Willy: who says you have to stop at the shirt? This incredible plaid shorts are available in green. Now you can don the green apparel from head to toe. Talk about festive! Shamrock Tie by Wes and Willy: a little too cool for just at shirt and shorts? Go super cool and suave with this incredible accessory. 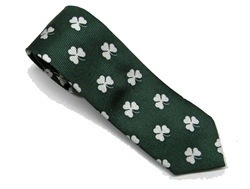 A tie is the perfect piece to pull together an amazing look for St. Patty’s Day. This entry was posted in boys clothing and tagged boys clothes, green, shamrocks, shirts, shorts, St Patrick's day, the boys store, tie, Wes and Willy on March 10, 2014 by Lacy.